Will I blow up my battery if I plug in multiple charging sources? Your battery can’t regulate how much charge it receives. It has no smarts at all. You could easily damage it by pushing too much “charge” into it. The thing is, that’s really not going to happen if you build your system correctly. 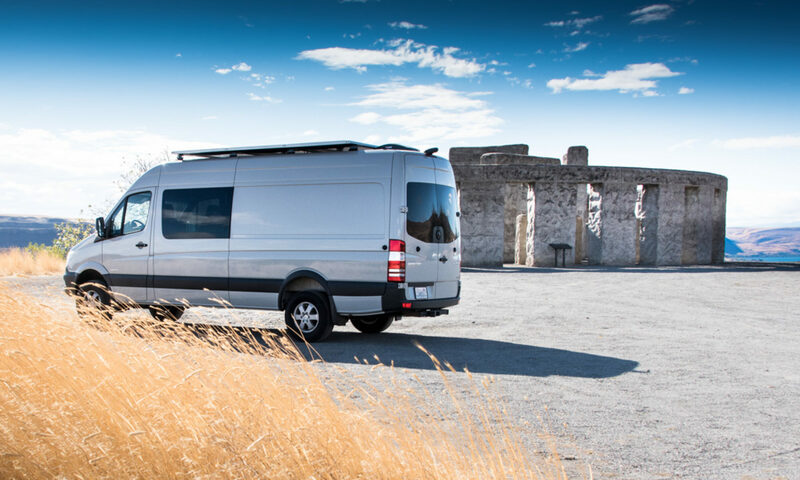 Conversion vans might charge their batteries using solar, an engine-powered charging source, and shore power. People often ask whether plugging more than one of these charge sources into the battery at once will hurt the battery. The answer is no, so long as you follow some simple guidelines. Each of these charging sources should be independently sensing the battery’s state of charge. Solar charger for your solar panels, inverter/charger for mains supply, and whatever you put in-line with the alternator input (like a battery combiner, DC-to-DC charger, etc.). Each of these charging sources should independently stop charging when the battery is full. So long as you aren’t going to exceed the battery’s charge rate by running all the sources at once, there’s no problem. The different components don’t have to talk to each other in order for things to work. Instead, they’re all talking a common language – Volts on the cables in your system. In other words, your solar charger will “listen” to the voltage from the battery, and start bulk charging when the voltage is lower than a certain amount. It will keep “listening” until the voltage gets to a certain point. Then it will change to absorb charging (for lead batteries). When it “hears” that the batteries are full (another voltage reading) it’ll switch to float charging just to keep them topped off. If you have shore power hooked up at the same time, your inverter is probably charging the batteries too. It’s doing its own listening. So long as you set the same charge points (when to move from bulk to absorb to float) in your inverter, it will change how much charge it provides at pretty much the same time as the solar charger. It doesn’t need to talk to the solar charger to make this happen, it just has to look at the outcome of what the solar charger is doing. The one exception to this is your alternator. In most vehicles, the alternator is “deaf” – it doesn’t listen, it just pushes a set voltage out to the electrical system. That’s perhaps one more reason not to charge your house batteries directly from your alternator, but to use a DC-to-DC charge controller instead. Overall though, so long as the alternator voltage isn’t too high, this shouldn’t be a problem. Because your house battery is (probably) quite large, the other components in the system will be “hearing” the voltage of the battery rather than the voltage that the alternator gives out. Read your battery’s specifications. It will give the maximum charge rate. That rate might be written in the format “C/[some number]” – like C/2 or C/4. This refers to the capacity divided by the number of hours to charge. Sometimes C/2 is also written 0.5C (C/4 = 0.25C, etc.). Another way of looking at it is what proportion of the battery’s Amp-hour capacity it can accept as a charge current. For a 100 Amp-hour battery, C/4 is 25 Amps (100 Amp-hours divided by 4 hours) . C/2 would be 50 Amps. Now add up the Amperage of all your different charging sources. So long as it’s under your charge rate, you’ll be OK. Because house battery systems are typically 200 Amp-hours or more, it’s unlikely you’ll be exceeding this value unless you have a very powerful charging system, in which case you have probably taken some other precautions to make sure you don’t cause charging trouble. Of course, most lithium based systems also have a built-in failsafe switch that isolates the battery if it is about to get overcharged or emptied. However, it’s not a good idea to rely on this system on a day to day basis. Once it’s tripped, you normally have to manually reset it. Until then, the battery isn’t able to function. Instead, make sure your charging equipment doesn’t try to charge beyond the battery’s safe upper limit. This is one reason why it’s important to make sure you buy equipment which can have its charge parameters set. That way, you can set them all to the same voltage and/or current values for each stage of charging, specific for your battery configuration. This is just as true for lead acid batteries as it is for lithium ones. Additionally, if you want extra peace of mind, you can use a battery monitor which contains a relay that will trigger when the battery is charged. That relay can then be used to tell your charging sources to stop, so long as they also have relays for that purpose. We use the Victron BMV700. It has a relay that can be set to trigger for multiple different reasons. Battery charge is one of those reasons. Battery monitors are like a very smart fuel gauge for your batteries. They help to make sure you don’t over-discharge your batteries. The Victron isn’t the cheapest out there, but it can tell you a lot about your battery state and usage. Our Victron solar charger and inverter also have sensing relays that can be programmed to switch charging off if they see that the relay on the BMV700 is closed. We don’t use the relays for this (there’s another, more complex/interesting approach you can take if you use all-Victron gear) but it’s an example of what’s possible if you buy the right type of equipment.